Nudibranch of the Week is Fryeria sp. This is one of the exciting new nudibranchs to appear in a book on Hawaiian opisthobranchs in preparation by Terry Gosliner, Cory Pittman and Pauline Fiene-Severns. 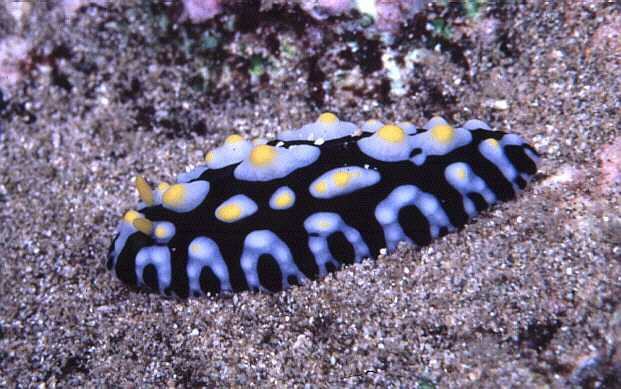 In many years of diving I have seen this slug only four times, once on mixed sand and hard substrate at about 40 ft. off the Sheraton at Ka`anapali, Maui, and the rest on hard substrate off O`ahu and the Big Island between 40-80 ft. The resemblance to the much more common Phyllidia varicosa is striking--undoubtedly some sort of mimicry is involved. One way to tell the two apart is to look at the underside. P. varicosa always has a dark line running the length of the foot; this species does not. More details will be revealed in the new book. Keep tuned! John and Marcia Hoover live in Honolulu, Hawaii. 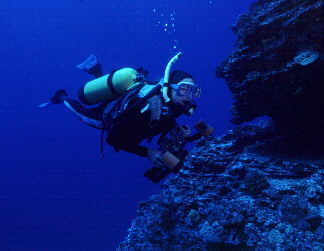 John has published two books on marine life of the Hawaiian Islands. His third, a field guide to the marine invertebrates of the Hawaii,is available now. With over 600 photographs, it covers over 500 species, including 66 of Hawaii's most colorful and interesting opisthobranchs. Updates and errata for John's invertebrate book are now available. Email John for a copy.